American Eagle asks microinfluencers, activists: What does Pride mean to you? The brand recently completed a Pride campaign that involved influencers such as Orion Carloto, Levi Jackman Foster, Max Emerson, and Andrés Camilo. American Eagle recently completed a social campaign aimed at empowering young LGBTQ Americans during Pride Month and beyond. The campaign included engagement with influencers and activists from the LGBTQ community, a clothing collection released to benefit an LGBT-focused organization, and a Facebook Live stream from the brand’s float at New York City's annual LGBTQ Pride March. In fall 2016, American Eagle launched its #WeAllCan campaign to enable young Americans to express themselves, celebrate individuality, and foster inclusivity. This year, the brand wanted to create an innovative campaign which would help spotlight the #WeAllCan platform during Pride Month. "We began planning for the Pride social campaign at the end of April, and everything was pulled together and activated in about one month," said Kristen D’Arcy, VP of performance marketing at Outfitters. The retailer’s social/digital partner, Cult LDN, aided with social activations around New York City's Pride March. American Eagle wanted to use the campaign as an opportunity to gather opinions and feedback from community activists which would help the brand support the LGBTQ community going forward. Additionally, the brand looked to run an in-store promotion during Pride Month to raise awareness, support, and donations for a non-profit organization focused on helping LGBTQ youth. American Eagle also wanted to utilize a network of social influencers who could help promote the campaign on social. Throughout June, customers could pick up American Eagle-branded Pride clothing and accessories, with 100% of proceeds going to the It Gets Better Project, a non-profit organization dedicated to preventing suicide among LGBTQ youth. The collection of Pride gear and accessories was co-branded with It Gets Better. "We partnered microinfluencers and LGBTQ activists to customize #WeAllCan tees with what Pride means to them," explained D’Arcy. "They shared their testimonials on social and encouraged their followers to shop the collection and to post against #WeAllCan for a chance to have their image featured on the American Eagle Outfitters float." Influencers selected for the campaign included Orion Carloto, a writer and poet with nearly 500,000 Instagram followers; Levi Jackman Foster, a New York-based artist and activist; Max Emerson, an actor/model with 792,000 Instagram followers; and Andrés Camilo, a U.S. Army officer who made waves earlier this year when he posed alongside his boyfriend in uniform. 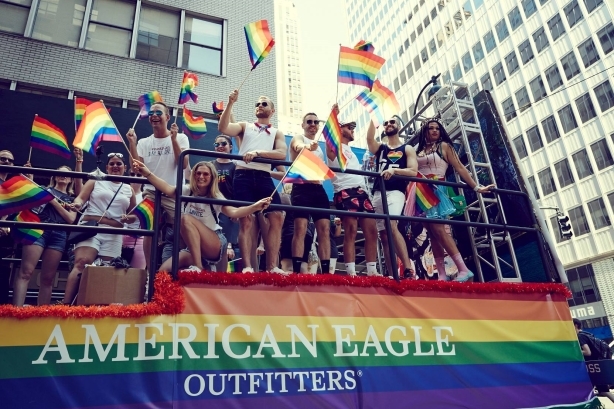 On June 25, the day of New York City's Pride March, American Eagle streamed on Facebook Live from the brand's float, offering a unique opportunity to join the march for those who could not attend in person. "Leading up to [the march], we invited the social community across the nation to ride with us [on our float] via Facebook Live," said D'Arcy. Select American Eagle stores across the country featured a Pride installation. Messaging encouraged fans to take a selfie with the installation as a backdrop and share the photos on social using the #WeAllCan hashtag. In early July, the brand released a highlight video on social channels of the Pride experience called American Eagle Humanifesto. American Eagle Outfitters released the video as part of a public declaration of commitment to the continued support of the LGBTQ community. During the Pride March in New York City, more than 90,000 people tuned in to American Eagle's Facebook Live stream. Total mentions using the hashtag #WeAllCan increased by 225% in June. The campaign also became an Instagram trending story. Sales of the 2017 It Gets Better/American Eagle Pride collection almost doubled, compared to the brand's Pride-focused collection released last year. The American Eagle Humanifesto video has amassed about 300,000 views on Facebook.